The main role of the Sports Development department is to focus on building links with local schools. Our schools programme has been developed to deliver high quality physical literacy curriculum time sessions and also provide out of school opportunities for children to engage in extra extended activities. We provide schools with a comprehensive programme designed to compliment and reinforce existing PE and academic syllabus based on developing physical literacy. Through the motivational and inspirational power of sport, and in particular football, we also aim to develop a child’s personal skills, improve their academic achievement, build self-esteem, encourage healthy lifestyles and ultimately enhance the pupil’s employability. As a Trust, we are proud to be able to offer quality sports and educational provision to a network of schools, groups and individuals throughout the calendar year. This is achieved through an extensive range of activities, each delivered by our highly skilled team of staff who are not only seen as coaches, but also positive role models by the many people that we come into contact with. Currently we are delivering a wide variety of sessions that include reading programmes, PE provision, PPA, lunchtime clubs, after school clubs, matchday experiences, school sports programme, holidays clubs, pre school and sponsored penalty shootouts! Premier League Primary Stars is a schools programme which uses the appeal of football and sport to connect and inspire with children aged between 5 and 11 years old in Primary Schools all over the country. · To increase participation in after school football and sports activities. · To enhance teachers’ knowledge, skills and confidence to deliver high quality PE. · To increase football and sports skills in children. · To support talented children into progression pathways in sport. Rotherham United Community Sports Trust deliver a number of sessions across the Borough to use sport as a tool to educate. The Kinder+Sport Move and Learn Project is a national school-based educational programme for children aged between 9-10 that has been developed by the EFL Trust and Ferrero. By combining six weeks of practical sporting sessions with classroom sessions, the programme encourages physical activity, promotes nutritional education and builds awareness of the importance of a healthy diet and active lifestyle. The programme content is developed by nutritional and educational experts in line with the recommendations in the Government’s eat well plate and the National Curriculum. Future Stars is a development programme for boys and girls aged 3-14yrs old. Children get a chance to learn and develop their all-around skills in a fun and safe environment. Players undertake football and futsal to further enhance their skills. Sessions are split into age groups U5/U7/U9/U11/U13s. These sessions take place at Parkgate Astro, a fantastic facility. Our player’s ability range from beginners to grassroots team players and we welcome children of all abilities. During every school holiday our Sports Development coaches run Future Stars Soccer Camps at Wickersley School and Sports College. 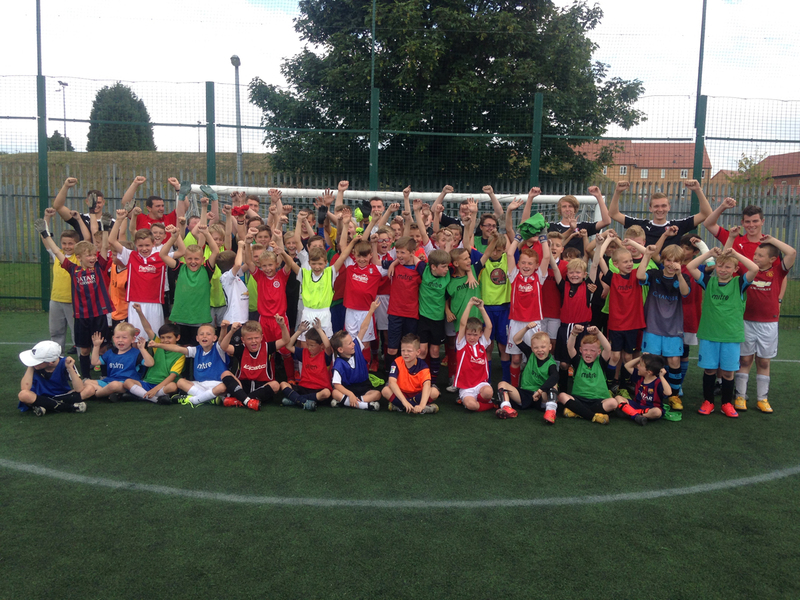 Future Stars Soccer Camps give children the chance to interact with each other, enhance their footballing skills through training and matches, all this can be done whilst having fun and keeping active. At the end of every soccer camp children are given gifts and have the chance to win medals and prizes, another key feature of our sessions are the visits from RUFC first team players who sign autographs and conduct Q and A sessions with all participants before having photographs taken which are used for certificates that are given to every participant at the presentation on the last day. Clubs deliver innovative sessions such as glow in the dark football to emphasise the fun, social element of the sport and soccercise that uses football as way to keep fit. For participants who want to progress in the game clubs create pathways with local community clubs to provide long term participation opportunities, whilst many clubs also deliver elements of the female talent pathway. The programme achieves this by providing a fun and informal environment, allowing participants to progress at their own pace and make friends at the same time. This is when we deliver a whole school day of focused Physical activities promoting healthy lifestyle choices which involves your whole school. Working in partnership with your school we will plan a fun filled day of activities where all the school will be involved. A club delivered by our staff before the school day full of focused, challenging but fun physical activity sessions designed to motivate the children for the rest of the school day. Can be used as a way of targeting specific groups within your Sports Premium Targets. A club delivered by our staff during the lunch hour. An excellent opportunity for our staff to deliver fun and active lunchtime sports challenges to engage the children in Physical activity. The Young Leaders Award teaches children Organisation and Communication skills where the information is targeted towards younger children. It can be used as a tool to raise self-esteem in the more challenging pupils who will hopefully go on to become ‘sports leaders’ and gain respect and status from staff and their peers within the school. These young leaders can then be used as an excellent sports resource during playtimes and lunchtimes. This programme is delivered to key stage 2 pupils taking place over one full day. We encourage pupils to explore racism as a concept and start to create mechanisms in which we can tackle this particular form of discrimination both in the classroom and within the community. A secondary outcome of the programme is to learn more about historical figures that have broken barriers and have become leaders in the field of equality. The chance to play at half time during a Rotherham United home fixture for local primary schools. This exclusive tournament is an excellent opportunity for Y5/Y6 pupils to play on the hallowed turf at AESSAL New York stadium. The team will play at half time at one of Rotherham United’s home games.